Caprivi Houseboat Safari Lodge is situated a few kilometres east of the Caprivi town of Katima Mulilo. It is nestled amongst a lush green garden overlooking the banks of the Zambezi River and is the ideal stopover location when travelling to or from Chobe National Park, Victoria Falls, the Okavango Delta and Moremi Game Reserve. The name of the lodge may be a bit confusing, this lodge is based on the banks of the river and is not a houseboat, the reason for the name is that as well as being one of the finest small lodges in the Katima area this is also the starting point for the excellent Caprivi Houseboat Safaris. This lodge is also the perfect base for self-drive tourists who wish to explore some of the region's other main draw cards: Mudumu and Nkasa Rupara (Mamili) National Parks as well as Bwabwata National Park. Transfers from Katima Mulilo, Kasane, Livingstone and Victoria Falls airports can also be arranged. Facilities at Caprivi Houseboat Lodge include a rose wood deck with lounge bar. Breakfast & dinner are available and highly recommended as the food here is of an exceptional standard and must rate as some of the finest lodge food we've experienced at any lodge in Namibia. The decor of the rooms and communal areas is simple and of a high standard and perfectly reflects the simplicity and elegance of the lodge. The main communal area which encompasses a bar and lounge area is on an open deck overlooking the river. It is an excellent place to sit and watch life on the river go by. From your perch on the deck you can expect to see plenty of birds, the occasional hippo, jumping tiger fish and local people going around their business on the river. Fascinatingly river transport is largely by means of mokoro, a hollowed out tree trunk canoe. Accommodation is in five rustic, but well decorated and equipped chalets, situated on the water's edge. 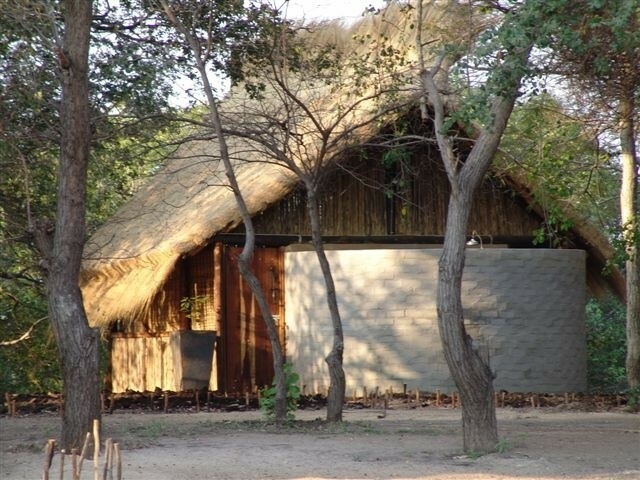 Each of the chalets has an open front which looks onto the river, this can be closed at night using canvas blinds, but expect to be lulled to sleep by the sounds of grunting hippo and woken by the early chorus of Namibian birds. En-suite bathrooms, mosquito nets and a ceiling fan are standard. The peaceful waterside location lends itself for boating and cruising at a leisurely pace. Fishermen should note the best angling months are from late April through to January for tigerfish and catfish and June to November for bream. Boats are accompanied by a skipper and knowledgeable angling guides are on hand. Caprivi Houseboat Safari Lodge offers superb value for money and is certainly a top choice for anyone requiring accommodation in the Katima Mulilo area. Caprivi House Boat Safaris offers the ideal opportunity to cruise 2 of the most famous rivers in Africa; the Zambezi and the Chobe. The former forms a 130km border between Namibia and Zambia. The latter meanders eastwards through the magnificent Chobe National Park, to join the Zambezi River at Kazungula. This unique floating safari will present all the fascinating array of fauna and flora the region has to offer. Drifting down these mighty rivers is the consummate route to a myriad of floodplains, riverine forests and breathtaking sunsets. There is no better way to end a magical boat trip than to relax around the warmth of a campfire on a secluded (and safe) sandbank. Caprivi Houseboats offer overnight boating safaris on 2 x 7.5m aluminum Outback Safari Boats. These are water-borne vehicles powered by 100hp outboard engines. Up to a maximum of 6 guests can be accommodated in each houseboats (although not more than 4 adults is recommended). This is the ideal excursion for those with an adventurous spirit - who want to get off the beaten track and explore. Each boat comes with an experienced skipper - who will keep you pointed in the right direction, suggest suitable mooring / camping areas (often of sandbanks in the river) and even help out around the camp. Although the accommodation is comfortable it is simple and certainly not luxurious and you are expected to get stuck in with many of the day to day chores of setting up camp, cooking etc. The beauty of these trips is that visitors can choose their own route, including overnight accommodation at Caprivi Houseboat Lodge itself. Current and onward destinations as well as specific interests are taken into account. For example a 2 to 4 night river safari can be incorporated into your existing itinerary with the opportunity to substitute a section of road travel for one by houseboat. Specialized activities such as fishing, birdwatching and game viewing can also be included into your route.